Look what I found at a silent auction last night. So creative! I just had to win this one. 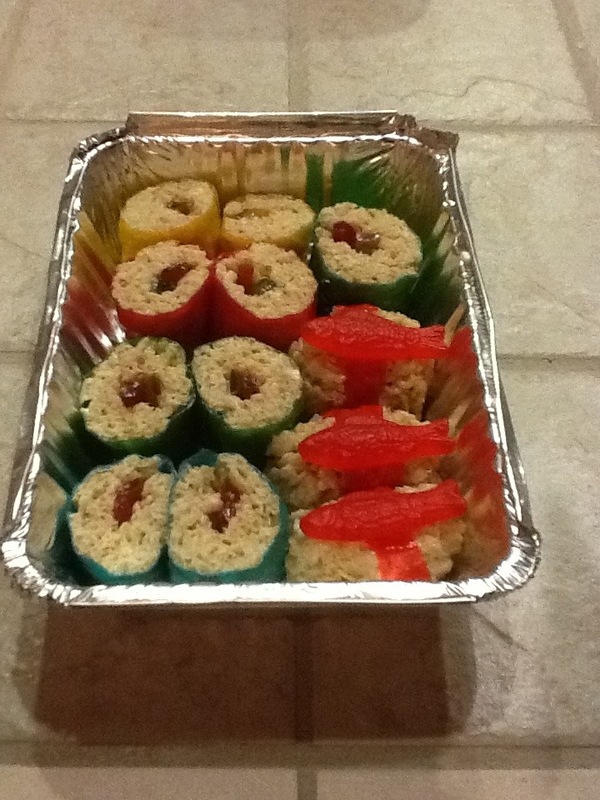 It’s made with Rice Krispy treats, fruit roll ups, and Sweedish Fish. I can imagine other ingredients that would work, too: mini m&ms, twizzlers, nerds, coconut, heath bits…of course not in the same roll. This is so cool… I had to share with my facebook friends! Those are adorable and creative! that’s genius! how fab would that be for a Halloween party! Thought this would make a funny birthday surprise for a friend who loves sushi and candy. Used Habro Clown Fish instead of Swedish Fish, and an organic fruit leather because I don’t like the flavor of fruit roll ups. The fruit roll up sheets are larger, so there is an advantage to that, but I just make individual pieces of rice crispy treat maki with little pieces of fruit licorice inside. Thank you for the idea!